So, you want to learn how to draw. 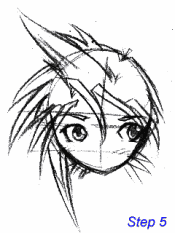 Well, in this tutorial, you’ll learn one of the styles used in manga or anime arts: Super Deformed (SD, in short) characters. In case you don’t know what SD character means, SD is a style of manga/ anime where actual sized characters is deformed in an extremely cute way. Due to its simplicity, SD characters are relatively easy to draw. And not only it is easy to draw, it is also less time consuming, and a very rewarding experience too (Aww… how cute ^_^). If you happen to be a beginner in drawing, SD characters will prove to be a very useful way to learn how to draw manga or anime characters. Interested to learn more? Read on! How should a SD character look like? Compare this to any ordinary anime character and you’ll notice the difference. NOTE: The proportion mentioned in the picture was not a standard in drawing SD characters. If you are not comfortable with it, adjust it. Next, draw a cross in the middle of the circle. 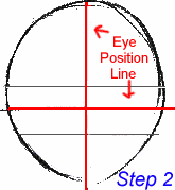 This is the ‘eye position cross’, this step is crucial to prevent you from drawing crooked eyes. Define the chin line, try to draw it with the least strokes possible, so that it doesn’t look messy. Practice does help to achieve this. 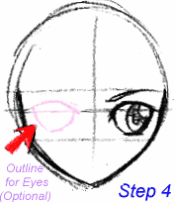 Now, draw the eyes and eyebrows to the the face (within the eye position range). Simple eyes will do the trick, and try to make them well balanced and symmetric to each other. This might need a lot of practice, but it was well worth the effort in drawing good characters. If you find it hard to draw the eyes, draft the shape first. 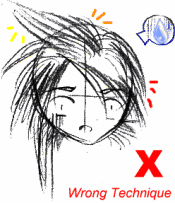 In anime drawing, hair is drawn in a bunch, i.e. 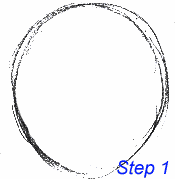 the overall shape of hair. No, it don’t have to be complex what-so-ever (it’s not even rocket science! ), you’ll be surprised how geometric shapes can create good hair! 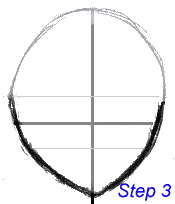 It proves to be useful in any form of art as you can review the shape beforehand, and easy to add details later (e.g. how the hair will look like if I added some accessories, drawing some strands of hair to make your character attractive, etc.). There you have it! 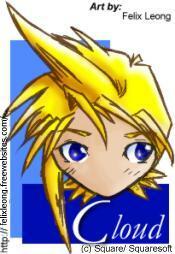 You should be able to draw a simple SD Cloud by now :). Add some details (mouth, nose, accessories…) to your character if you like to. When you are satisfied with your draft, you can draw it in ink and color it. Believe me, they looked nice in inks and colors, and you might want to make it your desktop wallpaper.